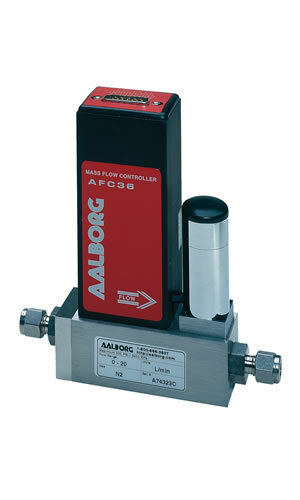 Model AFC mass flow controllers are designed to indicate flow rates and control set flow rates of gases. Each of these units incorporates an advanced straight tube sensor in conjunction with flow passage elements constructed of stainless steel. LED readouts of command modules are supplied with 0 to 100 percent calibrations. Zero and span adjustments are conviently accessible from outside of the transmitters. Output signals of 0 to 5Vdc or 4 to 20mA are generated indicating mass molecular based flow rates of the metered gas. In AFC mass flow controllers the combined gas streams flow through a proportionating electromagnetic valve with an appropriately selected orifice. The closed loop control circuit continuously monitors the mass flow output and maintains it at the set flow rate. AFC mass flow controllers include an electromagnetic control valve that allows the flow to be set to any desired flow rate within the range of the particular model. The valve is normally closed as a safety feature to ensure that gas flow is shut off in case of a power outage. AFC mass flow controllers are designed to meter and control flow rates of gases, and are available with flow ranges from 10 sccm to 100 slpm [N2]. Gases are connected by means of 1/4”, 3/8”, or optional 1/8”compression fittings. These controllers may be used as benchtop units or mounted by means of screws in the base. 1 x 10-9 smL/sec of helium max to outside environment. Complete Mass Flow Systems include Command Modules, transducers and cables. Command modules contain appropriate power supplies, digital panel meters with 3-1/2“ digit LED readouts and high precision potentiometers.External RS-232 or RS-485 are optional. Switches in the front panels of Command Modules select LOCAL or REMOTE reference signals, analog outputs are accessible through convenient 9 pin D-connectors.